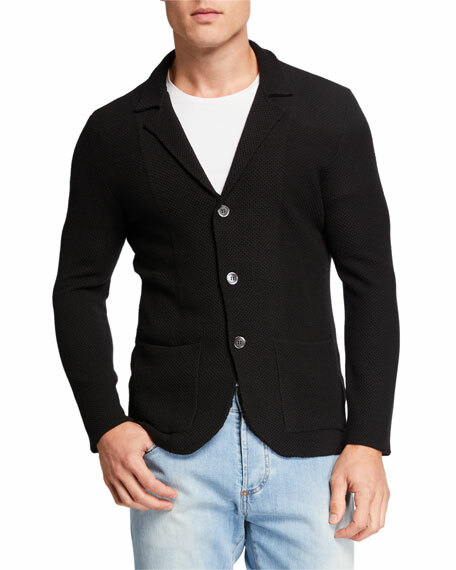 Isaia cardigan blazer in solid knit. For in-store inquiries, use sku #2395989. Ermenegildo Zegna jacket in tone-on-tone textured wool. Notched collar; two-button front. Unfinished sleeves. Chest and flap pockets. Double back vent. 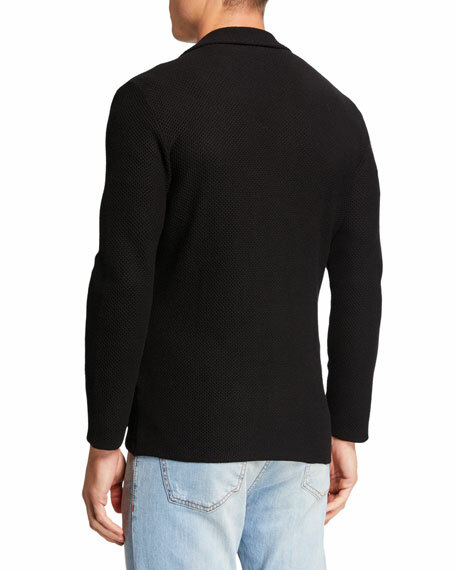 Ermenegildo Zegna jacket in tone-on-tone textured wool. Notched collar; two-button front. Unfinished sleeves. Chest and flap pockets. Double back vent. Wool. Made in Switzerland. Model's measurements: Height, 6'2"/188cm, Suit 40L, Shirt 14.5x35, Waist 32"/81cm, Inseam 33"/84cm.